The parents of condensed matter theorist Walter Kohn were killed in Hitler's Holocaust, after they sent their teenaged son to safety in England. Because of his German passport, however, young Kohn was held in internment camps as World War II raged, first on the Isle of Man and later in Canada. He later studied at the University of Toronto, and came to America to find work as a physicist. 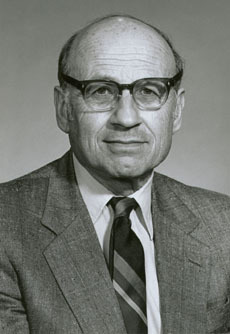 In 1964 he developed density-functional theory in quantum chemistry, superseding previous theorems that required data on the motion of every individual electron in a molecule in order to determine the bonding in atoms and for mapping chemical reactions, and instead showed that reliable conclusions can be reached without this data provided that the average number of electrons at a specific location is known. With the new generation of more powerful computers, his density-functional theory has been invaluable in research into the electronic structure of materials, and allowed the complicated mathematics of quantum mechanics to be applied the study of chemical bonding between atoms. Kohn won the Nobel Prize for Chemistry (shared with John A. Pople) in 1998.